Rock crushers are now so commonly used in industries like mining and construction that it may be hard to imagine working without them. It was only during the early part of the 19th century, however, that the first mechanical rock crusher designs were developed. The first U.S. patent to be issued for a crusher was in 1830, says 911 Metallurgist, which has published a history of rock crushers. The design used the drop hammer principle that would later become essential in mining operations. The following decade, in 1840, a second patent was issued for another crusher. This design included a wooden box and cylindrical drum covered in iron hammers or knobs. It does not appear that either of these designs were ever actually built or used though. Inventor Eli Whitney Blake is credited with designing the first mechanical rock crusher that was actually put to use. Blake’s design, which utilized a toggle linkage construction, was known as the Blake Jaw Crusher. Blake’s crusher was announced in 1857 and patented in 1858. Perhaps surprisingly, the same basic design is still in use today for rock crushers. In the years following the design of the Blake Jaw Crusher, another type of crusher was designed. A gyratory crusher was patented by Philetus W. Gates in 1881. Thomas A. Edison also designed a rock crusher to use in his own mining operation. Edison’s design used giant rolls to function as a primary crusher. These machines never gained much popularity though because the gyratory and jaw crushers were more versatile. The competition between Blake’s and Gates’ styles of crusher continued for a number of years. Larger and larger crushers were designed as the escalating competition heated up, which became particularly important with the introduction of the steam shovel that transformed open pit mining. There have been a number of improvements to the basic jaw and gyratory crusher designs throughout the past 150 years, but in many ways these modern crushers still use the same basic approach to crushing rock. A double toggle jaw crusher that is most commonly employed in mining operations today is, at its core, an improvement on Blake’s design, for example. Rackers Equipment has been providing modern crushers and other equipment to contractors in Missouri and across the country since 1989. 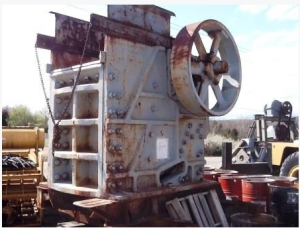 If you’re looking for a new primary crusher or secondary crusher for your business, we maintain an extensive inventory of new and used crushers from the many of the leading equipment brands. Check out our inventory online now, or give Rackers Equipment a call today at 573-635-8700 to request a quote on a crusher or any other mining or aggregate equipment you need.